News | | Published: 12:48, Tuesday April 4th, 2017. Caerphilly Castle is hosting two winged beasts for an eight-week spell, after Cadw confirmed its dragon had returned to the grounds with a mate. Dewi the dragon first pitched up in Caerphilly on St David’s Day last year, and has returned to Wales’ biggest castle with a female friend – Dwynwen. 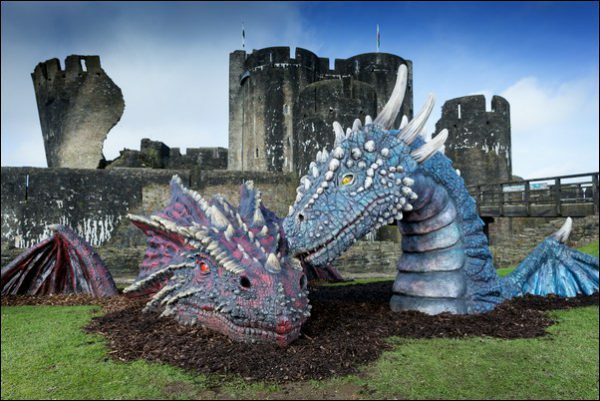 The romantic reptiles — named after Wales’s patron saints — will cosy-up at Caerphilly Castle during April and May, before Dwynwen embarks on an epic summer tour across Wales’s historic sites. The tour announcement comes as part of the Welsh Government’s historic environment service’s Live the Legends campaign, which will bring Wales’s dramatic stories to life during Visit Wales’s 2017 Year of Legends. The dragons have made Caerphilly their home just in time for the castle’s Easter period, which last year saw more than 90,000 visitors during the month of March alone. Upcoming events at the Castle include Easter eggs hunts and the Medieval Easter Weekend (16 – 17 April), which will offer visitors a glimpse into the site’s medieval past with the return of civilians, knights and royalty from its heyday. Ken Skates, Cabinet Secretary for Economy and Infrastructure, said: “Our original dragon attracted a record-breaking 120,000 visitors during his tour of eight Welsh castles last year and we hope to build on this success this year. “Wales is known for its epic stories, from the myths of the Mabinogion to the fables of the Welsh Dragon, and Cadw’s Live the Legends campaign is designed to bring them to life during the 2017 Year of Legends. The Cadw dragons were brought to life by a team of 16 at Cardiff-based prop design specialists, Wild Creations. The colossal creatures, which collectively weigh a whopping two tonnes, were sculpted and moulded before being built out of fibreglass. Visitors to Caerphilly Castle will have the chance to meet Dewi and Dwynwen by normal site admission from Monday April 3 April to Sunday May 28. To find out more about Cadw’s Live the Legends campaign and to discover where the Dragons will next appear, visit www.cadw.gov.wales/livethelegends.